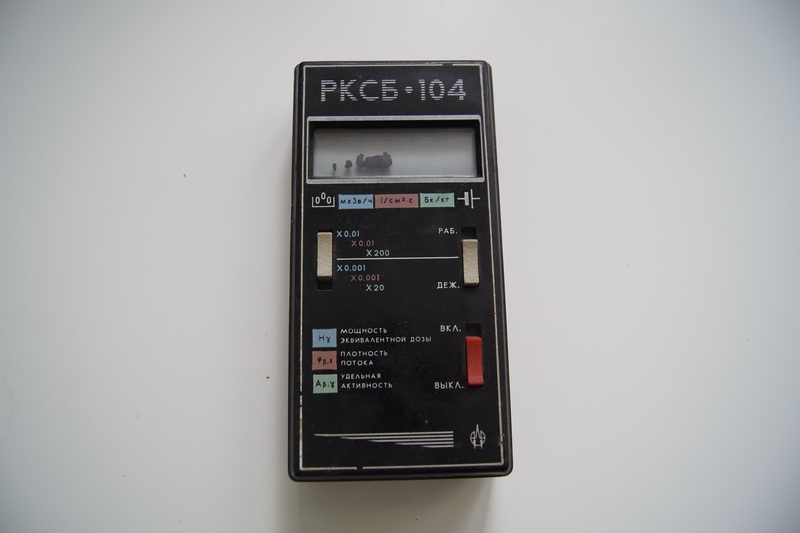 I've always wanted to add sound to the soviet RKSB-104 dosimeter I own, so one very early morning and a bit of boredom later, here's what I came up with. 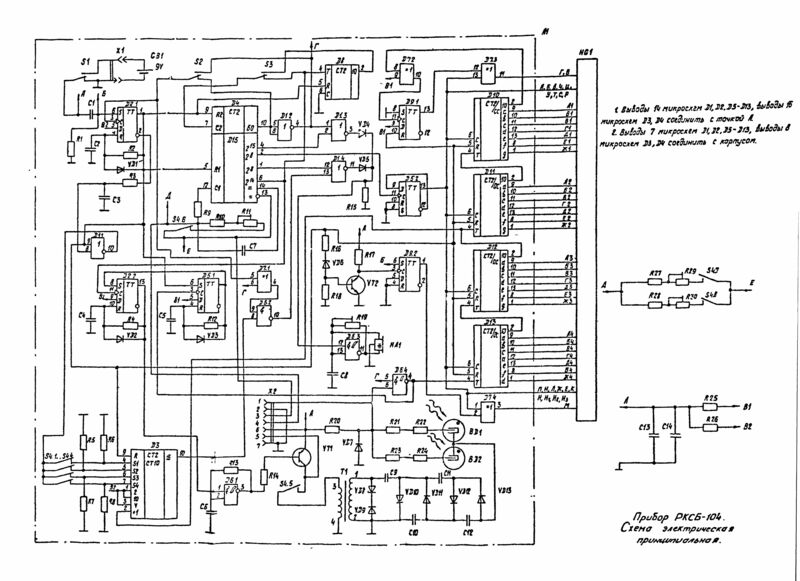 Let's take a look at the schematic. As you can see, it's incredibly simple, and entirely built ouf ot discrete logic and analog components. In the middle of the circuit, just to the top left of the two Geiger-Muller tubes with resistors, you can see the two parts of the circuit we need. You can see that the tone generator is based on D6.3, and has what appears to be a bipolar piezo speaker attached to it. Pin 12 of the gate goes out to the circuit that generates signals for "ALARM" and "Measurement complete". We don't really care about that - what we do care about, however, is that it generates an annoying tone when we connect VCC(9V) to pin 12 of said gate. We're going to use that to give us the sound. 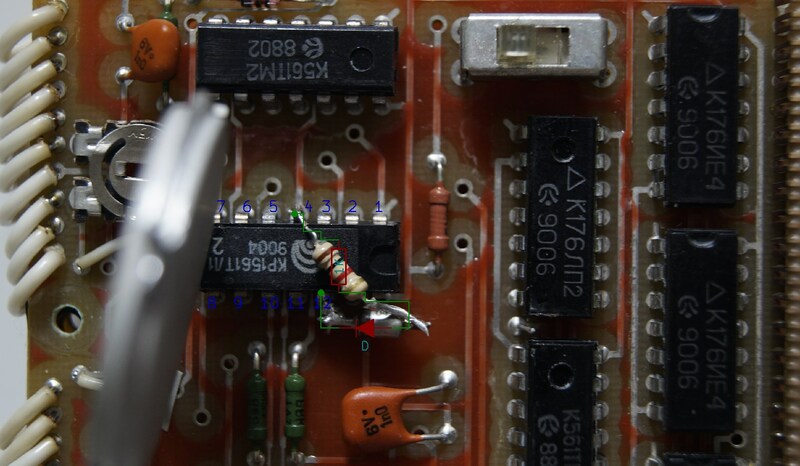 Just a bit below, you can see that both tubes go through two resistors, and are joined by a common wire that leads into pin 6 of a NAND gate with pin 5 going directly to VCC(9V). The reason we simply can't hook up the tube outputs directly to pin 12 of the tone generator is because of the way GM tubes operate. The ionisation inside the chamber effectively acts as a pull-down resistor, connecting the two shared outputs to ground. This means that the output is continuously tied high, and is at an unusable voltage. To get around that, we need something that would invert the signal, but we don't need to make anything, because we're going to use the same circuit the designers made to do the counting. Here's how the modification looks like. What we're doing there is connecting the "sound enable" pin to the output of the NAND gate, which acts as an inverter, through a 1k resistor(just for safety), and a diode. Why the diode? Because if we connected it directly to the output of the NAND gate, with or without the resistor, the dosimeter would enter a runaway mode when it either stops counting, or turns on the alarm, because it will create a positive feedback loop. To avoid that, we can simply use a diode, so the NAND gate can turn the sound on, but the alarm can't create false particles. And this is how the modification looks on the PCB. Luckily for us, both gates are physically on the same IC, so all we have to do is solder a diode in series with a resistor between pins 4(NAND), and 12("sound on") of the IC that is mounted directly below the piezo speaker. WARNING: Do not press on, or hit the piezo speaker - it's an older, very sensitive model that can create very high voltages that can severely damage the circuitry. Another thing you have to remember is that the piezo speaker body is fully metal and conductive, so you have to thoroughly insulate the modification after it's done. I had to take the device apart twice, trying to figure out what went wrong, and thankfully I didn't kill anything.